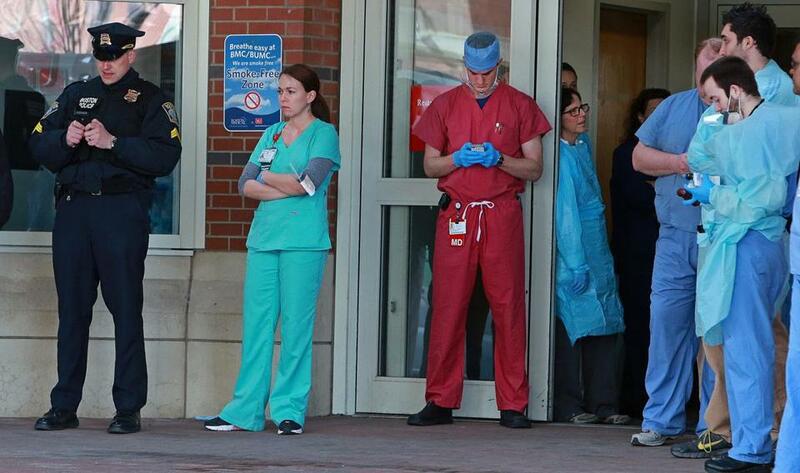 Boston Medical Center personnel wait for victims from the marathon bombings to arrive. If there is any silver lining in the violent Marathon attacks Monday, it is that Boston is home to some of the world’s finest hospitals, physicians, nurses, and medical staff. These highly trained professionals must be thanked and praised for their calm, heroic response in the face of unprecedented carnage. They not only ably treated the wounded but also provided some of the most accurate information available in the first hours after the explosions. Care for the injured began at the scene, where the medical tents usually reserved for treating dehydration and blisters suddenly became field hospitals. First responders, including military medical personnel returned from Iraq and Afghanistan, raced to stem the bleeding and stabilize patients for transfer. Others simply sat with victims, holding their hands while trying to quiet anxieties as they waited for treatment. Elsewhere, local medical centers had, within minutes of the blasts, activated long-held emergency plans, setting up triage units and opening operating rooms to accommodate as many patients as possible. Off-duty doctors and nurses rushed in to help. They went to work amid additional security threats, locked-down facilities, and armed law enforcement officials. The quick action, combined with top-notch trauma care, undoubtedly saved lives. Thirteen hospitals treated more than 180 victims, many in critical condition; at least 10 of them were children. Speaking to the press, trauma surgeons and emergency room doctors from the largest hospitals — including Mass. General, Brigham and Women’s, Boston Medical Center, and Children’s — updated the public regularly with detailed casualty reports, describing emergency amputations, shrapnel wounds, fractures, ruptured internal organs, and severe burns. In doing so, they supplied some of the first clues as to what could have caused the injuries they were treating. They also added context to the day’s events, telling of a volume and scope of injury worse than any they’d seen before. Yet if what they described was horrific, the physicians’ unruffled presence on television offered a needed reassurance that everything possible was being done. And while their work is nowhere near complete, knowing these men and women are caring for the wounded should give us all a bit of solace.